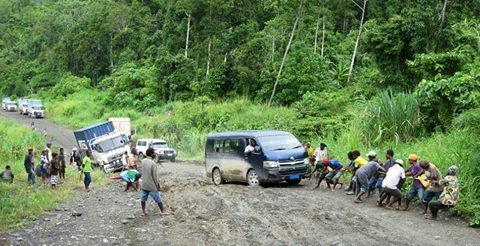 Commuters, business houses and truck operators including visitors from other countries travelling the Ramu-Madang portion of the national highway turn to wonder if this is a national highway or a logging track. Tax payers, including this writer wonder where the tax moneyis gone. Local Madang MP’s are totally ignorant on the development lifeline while Madang Provincial Works Manager is struggling to secure funding to fix the road. Madang hosts huge projects including RamuNiCo Mine, Marengo Mine, RD Tuna, RD Cannery, PMIZ and institutions like DWU, Madang Teachers and Technical colleges etc, yet the road linking these services is in a totally dangerous situation. Container trucks and fuel tankers are running off roads or simply capsize due to very bad road condition while travellers experience dangerously bumpy rides and most of the time seen pulling the very PMV buses or truck they travel as seen in the picture taken recently at Ono mountain in the Usino-Bundi portion of the highway. The bad road condition is a slap on the face of a country that boasts LNG Project and now seen fit to host international and regional events with the upcoming 2018 APEC Meeting. The government is totally incapable to serve its people, yet pretends to the outside world that every Papua New Guineans live a very healthy and prosperous live. It’s completely worst and frustrating at times when seeing container trucks lined up hills and valleys of Madang-Ramu highway while commuters struggle during rainy seasons to reach their destinations. How long can we tolerate this?….